In Virtual Anthropology, the rendering of a virtual object on the computer screen allows to inspect its geometry by turning, magnifying, clipping or viewing under different light settings. However, the rendered image remains a two-dimensional projection of a three-dimensional object. Understandably, real people demand a real object in their hands to fully appreciate its characteristics or to show it to other real people when no screen and software is available. 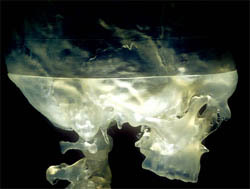 Virtual objects can be brought back to the real world by Rapid Prototyping (RP) techniques. Different RP techniques use different materials and methods, but they are all based on the same principle - creating a three-dimensional structure layer by layer.